Safety Quintin Mikell has agreed to a 4-year contract extension. End Juqua Thomas could sign Friday. Quintin Mikell , here stopping Dallas' Terance Newman in October, said yesterday: "I'm happy where I am." Most of the outside attention regarding the Eagles' potential free agents has been focused on quarterback Jeff Garcia and wide receiver Donté Stallworth. Inside the organization, the two players the Eagles have wanted to retain the most are defensive end Juqua Thomas and safety Quintin Mikell. Half of that mission was completed yesterday when Mikell agreed to a four-year contract extension that will keep him with the Eagles through the 2010 season. Details of the deal were not released, but it is believed to be comparable to a three-year deal signed by San Francisco safety Keith Lewis earlier this month. Lewis received a three-year contract worth just under $3.6 million, including a $650,000 signing bonus. Barring some unforeseen circumstances, the Eagles are also expected to complete a deal with Thomas when free agency opens Friday. Even though he is one of their own free agents, the Eagles cannot re-sign Thomas until the start of free agency because of a stipulation in his contract from last season. The Eagles figure to make some outside moves in free agency, and they still hope to re-sign cornerback Will James before the market opens Friday, but they feel it is essential to bring back Mikell and Thomas. Mikell, 26, joined the Eagles as a rookie free agent out of Boise State in 2003, and during the last two seasons he has emerged as their most prolific player on special teams. "Quintin has been a really good football player for us," Eagles general manager Tom Heckert said. "He's a vital contributor for us on special teams and does a very solid job when he's on the field defensively. We're glad to keep him here in Philadelphia." Having already earned recognition as the Eagles' special-teams MVP as voted upon by his teammates the last two seasons, Mikell is hoping he can contribute even more in 2007. "The main thing is I'm going to continue helping with special teams, but my goal is also to become a starter," Mikell said. "If I'm still working toward that, I'll become a better player. I've been told since the season has been over that if I produce, I could earn myself a starting spot. That's the way I'm going to go into the season. I want to earn a spot in camp. If I don't, so what? I'm still happy where I'm at. At the end of the day, it's all about winning." With free-agent safety Michael Lewis expected to leave the team, Mikell could play an even more significant role on defense next season. 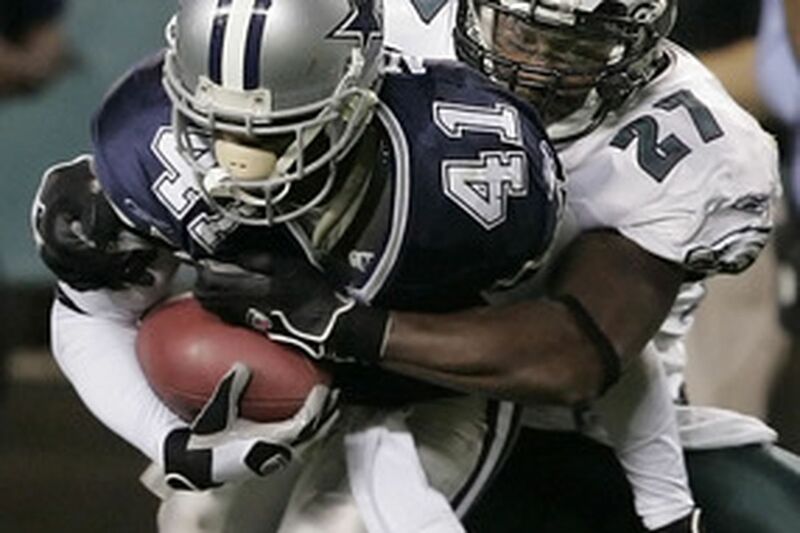 Mikell's most memorable play of last season came on Christmas night when he made a fourth-down tackle of running back Marion Barber to complete a goal-line stand in the Eagles' win over the Dallas Cowboys at Texas Stadium. Mikell led the Eagles' special teams with 35 tackles last season and also had an outstanding performance at free safety while filling in for Brian Dawkins in the team's season finale against Atlanta. Mikell registered six tackles in the win over the Falcons. Dawkins, of course, will be back at free safety next season, and Sean Considine is expected to remain the starting strong safety. Mikell, however, could fill the hybrid linebacker role that defensive coordinator Jim Johnson used Lewis in last season after the veteran strong safety lost his starting job to Considine. It was clear that Mikell was happy to finish negotiations with the Eagles. He said contract talks had been going on for more than two years with the team, and he changed agents at the end of the 2006 season. "I wouldn't say it was a tough decision," Mikell said. "To me, more money doesn't necessarily mean more happiness. I've established myself here, I know the system, I know the coaches and they know me. I have a family here and a child on the way. It didn't make a whole lot of sense for me to make a move. I'm happy where I am, so why rock the boat?"